A round tower or large curved bay window? This is almost certainly a Queen Anne. 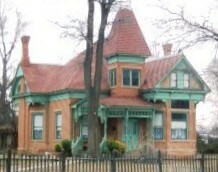 For many this style is the quintessential Victorian. The Queen Anne received its introduction to America at the 1876 Centennial Exposition in Philadelphia. 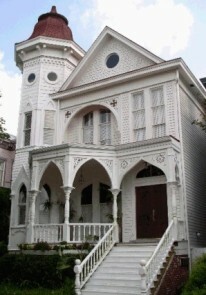 Named and popularized by a group of 19th-century English architects led by Richard Norman Shaw, the extensive embellishment of exterior details, as well as the expansive and picturesque porches captured the heart of the American public and quickly replaced the Second Empire and Gothic Revival styles as the most popular of the times. 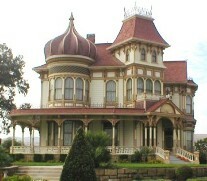 Steep roofs and porches were very important in this style. 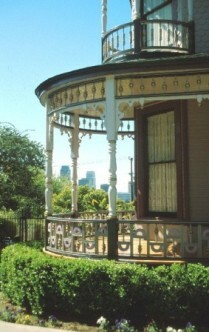 Elaborate, bracketed turned posts and railings were highly visible decoration. Many houses were painted with up to six colors creating a beautiful portrait on the landscape. This "gingerbread, decoratively rich style was dominant during the period from about 1880 until 1900 decreasing in popularity through 1910.
new technology. An expanding train network allowed manufactured parts to move around the country with relative ease and speed. Various and numerous publications on house building, trade catalogues, and architectural pattern books provided designs and excitement to thousands of builders. 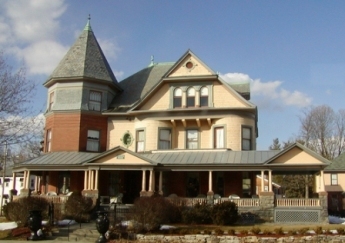 This excitement created distinctive American features for the Queen Anne style, in particular the extensive use of wood for shingles, cladboard, posts, porches and decorative exterior details. The introduction of balloon framing during the latter half of the 19th century was an important development in the building trade. It replaced traditional hewn timber construction. 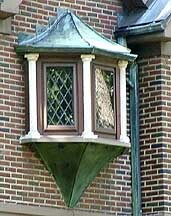 This new framing method allowed complicated architectural features such as bay windows, overhangs, and towers to be simplified and somewhat standardized. It was during this period of technological invention that mass produced nails, doors and windows, hardware, and other needed materials were mass produced. 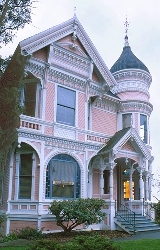 Classical detailing was also incorporated in the American Queen Anne designs. Reflecting a renewed interest in America’s Colonial past, classical cornices at the eaves, closed pediments at the gables, and wood panels with classical motifs like sunbursts, and acanthus leaves were displayed as exterior decoration. 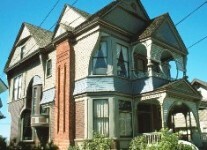 •	A prominent corner tower, usually round but also square. •	Horizontal bands of leaded windows.